This market was actually outside of Cusco but very close and the name of it is San Pedro. Markets are one of my favorite parts of visiting a new city because this is where a visitor can witness culture and true daily interactions between locals. We stopped by on a weekday after lunch time and had free reign of the place. 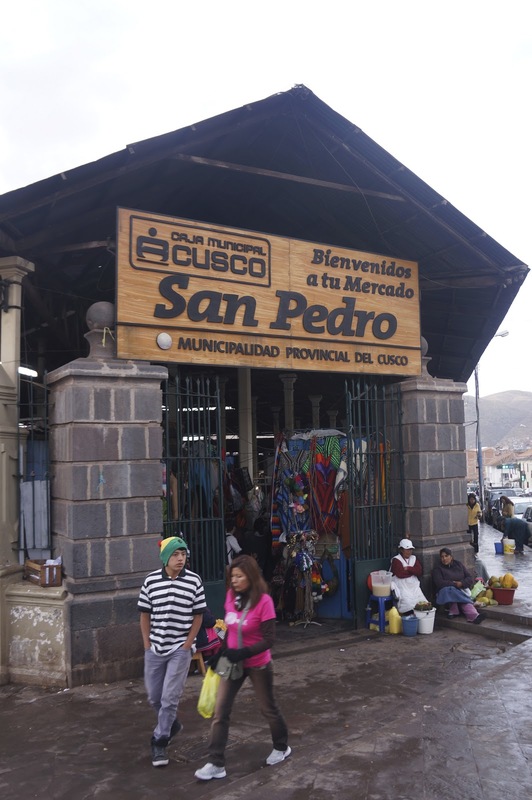 Our guide told us that indigenous people trade, sell and buy at this market and may not want their picture taken. We were to hold our cameras low and be inconspicuous if we wanted to take photos. The two ladies at the front entrance to the market were (I think) selling a corn beer home brew (see milky yellow liquid) but we didn't try it. Most of the ladies who work the market stalls are indigenous. This means they likely come from the Inca lineage but they'd never call themselves Inca. Instead, they are "peasants." You'll notice many are nodding off in these photos but it was just after lunch time and they usually get up before dawn to tend to their animals and prepare for the market. After siesta the ladies woke and started back to work. This woman who is illuminated nicely by the light from outside works to clean green onions. I was particularly amazed by the massive kernels on the corn. Forgive me for not holding something up to show the size comparatively in the photo but many of the kernels were the size of dimes. This is of course used to make corn flour.